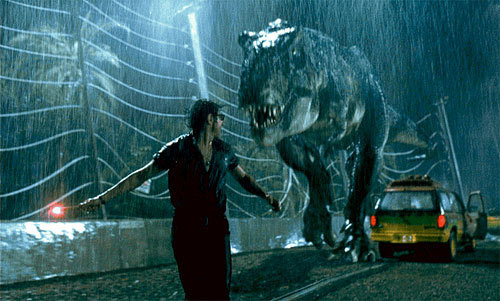 Steven Spielberg’s Jurassic Park movies debuted on high-definition Blu-ray on Oct. 25, 2011, in a Jurassic Park Ultimate Trilogy set from Universal Studios Home Entertainment. The set, which came out on DVD as well as Blu-ray, includes Spielberg’s original 1993 dinosaur movie, based on the best-selling book by Michael Crichton ; 1997 sequel The Lost World: Jurassic Park; and 2001’s Jurassic Park III, directed by Joe Johnston (The Wolfman). Universal says all three films have been digitally restored and remastered for the high-definition release. And the sound, including John Williams’ score, is in 7.1 surround. 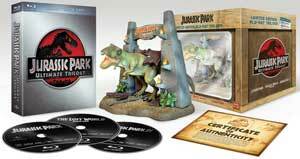 As well as the DVD and Blu-ray Trilogy sets, a Limited Edition Blu-ray Trilogy Gift Set also were released, containing the three movies and a T-Rex statue. The adventure film franchise has grossed nearly $2 billion combined in theater worldwide and stars Sam Neill (Daybreakers), Laura Dern (Tenderness), Jeff Goldblum (Morning Glory), Samuel L. Jackson (Mother and Child) and Richard Attenborough (1994 Miracle on 34th Street). The third film brought in Julianne Moore (Chloe), Vince Vaughn (Swingers), William H. Macy (Fargo) and Tea Leoni (Deep Impact). The original science-fiction movie also wowed audiences with its breakthroughs in special effects. Many of those were included in the Jurassic Park Trilogy DVD released in 2001. Pocket Blu app that allows a smartphone to interact with the Blu-ray player.